Driver 3, incompetence and corruption: one, two or three things? Let's get one thing clear from the start. Medical science in the latter part of the 20th Century and the earlier part of the 21st has advanced at a dizzying speed. The average lifespan (at least in the First World) has been extended by decades in the last century or two, and the pace of the advance of that science is accelerating, not slowing. With stem-cell research, breakthroughs in cloning, keyhole surgery and more, humans will soon become all but immortal. There will be no illness, no injury, no trauma so severe that it can't be repaired, perhaps using replacement organs grown from your own cells, taken at birth and stored until they're needed. This is a good thing. Because it means that, hopefully within our lifetime, it'll be possible to take the people responsible for signing off Atari's "Driv3r" as finished and ready for sale, imprison them in a dingy dockside warehouse, beat them to a prolonged, blood-soaked death over a period of several days using jagged rocks, then bundle them into a waiting car, take them to a backstreet clinic, have a corrupt surgeon quickly revive them before brain death occurs, carefully and diligently restore them back to health over a recovery period of weeks and months, probably involving lots of exhausting and painful physiotherapy, and then drag them back to the warehouse and beat them to death again. Except slightly more brutally. That this is an awful, awful game is beyond any reasonable doubt. Scores ranging from 3/10 (Edge) to 3/10 (GameCentral) and all the way up to 3/10 (Eurogamer) testify to that (your reporter, incidentally, on playing the game extensively for himself can confirm that both the reviews and the scores are accurate), and enough has been written about the game already for there to be no need for the finer details to detain us here. All of the elements of a good game are in place, but only in the same way that all the elements of a spaghetti bolognese are in place if you chuck some dry spaghetti, cold tomato puree and frozen minced beef into a bowl. What you don't do then is declare the job finished and serve it up to the customers in your restaurant for £45. But that's precisely the stunt Atari have attempted to pull this month, in foisting the most blatantly, appallingly unfinished game in living memory onto the world's gamers - and having the mindbending gall to do it at a "premium" price point five quid higher than the already-extortionate norm for good measure. "Awsome game. just look at the grafik and the things you can do I thiunk it's realy greate"
So far so mundane, though. After all, shoddy half-baked products are the videogames industry's speciality - when did you last buy a DVD movie or music CD that needed you to download a separate "patch" off the internet to make it work properly? That, of course, is why we have the press - to warn consumers off such cynical and shabby would-be cash-ins and protect gamers with honest and perceptive professional reviews. Unfortunately, it doesn't always work out like that. A storm of controversy has blown up around the wildly out-of-step high-scoring reviews given to Driver 3 by, most notably, print mags PSM2 and Xbox World, both of which are published by UK magazine company The Future Network, which controls most of the British games-magazine market. Word rapidly circulated that the scores were the result of trade-offs between the Future magazines and Atari's marketing department, whereby the magazines would be allowed exclusive access to review code in return for guaranteeing 9/10 scores in advance. The twist was that this review code would be several weeks away from completion, buggy, and not necessarily representative of the final quality of the game. Nevertheless, the mags accepted this deal, and duly delivered the scores required of them. "It's a great game and we stand by the review... perhaps a 9 was a little too enthusiastic"
This isn't, of course, the first time this sort of thing has happened, nor anywhere near it. Your reporter was subjected (unsuccessfully) to similar pressures by Future management when he worked for the company as far back as the early 1990s, and tales of other games benefitting from such chicanery are legion. 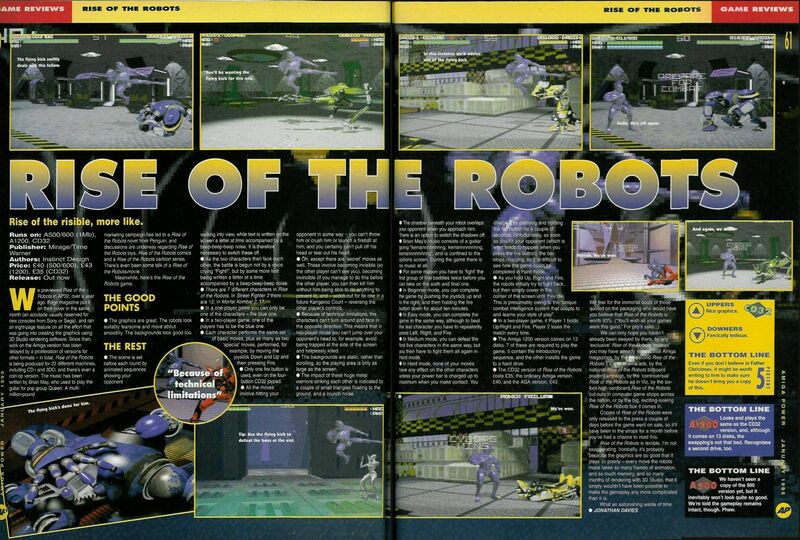 Who could forget Rise Of The Robots - from a previous incarnation of Atari - garnering 90-plus scores from various Amiga mags? ("Arms were twisted... let's leave it at that", said one editor a few months later). Or Lucasarts' diabolically useless Phantom Menace game notching 9/10 from Official Playstation Magazine a year or two later, coincidentally after some lavish trips to the Skywalker Ranch in America for some Star-Wars-fanboy journos? And the less said about the same mag's run of 10/10 scores for all of the increasingly-rubbish Tomb Raider series the better. So in a sense it's a little surprising that everyone's kicking up such a big fuss about it this time. The UK videogames magazine business has been so debased and compromised for so long now that those of us who know anything about the way it operates find it hard to summon up the outrage that such blatant and craven corruption deserves. Editors are rarely told explicitly by their managers to do such things, but are placed in positions where there is often little realistic alternative. But the most depressing thing isn't that it happens. The most depressing thing is how little it matters. The industry's chattering classes are full of fret about the implications of DriverThreeGate, but the truth is that there are unlikely to be any. The percentage of gamers who read print videogames magazines has been in steady decline for years, and is unlikely to reverse as more and more people get access to broadband and the limitless supply of gaming information (and more importantly, moving/playable footage) it offers. The most successful gaming magazine currently in print (Official Playstation 2 Magazine) reaches less than 5% of its potential audience of PS2 owners, and most mags struggle for even a small fraction of that. The overwhelmingly vast majority of gamers never buy or read videogames publications (and who can blame them? ), and hence what those mags say about Driver 3, or what their reasons for doing it are, will never even enter their sphere of consciousness. When the nation's biggest game retailer offers no-quibble money-back guarantees on any game if you don't like it, why pay someone else five or six quid to illiterately and ineptly judge a half-finished version of it for you, when you can just try it for yourself for 10 days (probably at least twice as much time as the reviewer got to spend with it, and you've got the proper finished version too) with no risk and make your own mind up? "The whole question of how trustworthy reviews are has been given an airing again - along, of course, with the ultimate question of the credibility of publications which are supported by ads for the products which they attempt to review impartially." So here's the real lesson of Drive-three-er, chums. Videogames magazines and videogames publishers nowadays exist solely as a mutual-support network aimed at squeezing money out of your pockets and into theirs. They know only too well that the days of games mags are numbered, so they have no interest in building reader loyalty, and hence no interest in integrity. All they want is to get as much cash out of you as possible before they die forever. And the best way of doing that is by hyping publishers' games, artificially inflating readers' enthusiasm, getting lucrative advertising from the publishers in return, and meanwhile cutting back on staff and budgets to the point that even reviewers naive enough to want to do their job properly simply don't have the time or the resources for it. To criticise games mags for doing that in the current climate is a bit like criticising a hungry tiger for killing antelopes. Driver 3 is going to sell in huge numbers regardless, because gamers are credulous and stupid and 97% of them don't read reviews in the first place, so why cut your own throat and piss off your advertisers by telling the few readers you have left something that most of them don't want to know anyway? Also, the harsh truth is that magazine readers deserve no better - if you're going to buy Official Playstation Magazine in hundreds of thousands and let the likes of Arcade die, then you're sending a pretty clear message out to the mag publishers, and that message is "We like being spoonfed bland corporate cheerleading tripe that says all games are great and worth buying, because that makes us feel good about buying them, so please give us more". The number of people rushing to games forums to defend Atari's right to rip them off with a cynically-priced, half-finished, shoddy rush job of a fundamentally-broken game (and even if you somehow manage to glean some enjoyment from it, those things are true regardless) only serves to back up that bleak assertion. Games magazines, and to a considerable extent the entire concept of professional games reviewing, simply don't matter any more. If you want the job doing properly, do it yourself. (NB If you object to GAME's high prices, obviously there's nothing to stop you trying out a game, returning it within 10 days for the refund even if you like it, and then buying it from somewhere else at a more reasonable price.) We should be grateful to Driver 3, and to PSM2 and Xbox World, for providing the clearest illustration of that truth that anyone could wish for, rather than bitterly attacking them for it.